Join us at the Lacey Community Center for our Annual Members Meeting on February 8, 2018 from 5:30 to 8:00 PM. The South Puget Sound Salmon Enhancement Group will be serving up tasty appetizers and Taylor Shellfish will be providing their famous oyster bar! Local bluegrass band, Straw Hat will join us from 5:30-6:30 while you enjoy a delicious craft beer or glass of wine and nibble on honeyed brie, smoked salmon and Talyor clams. 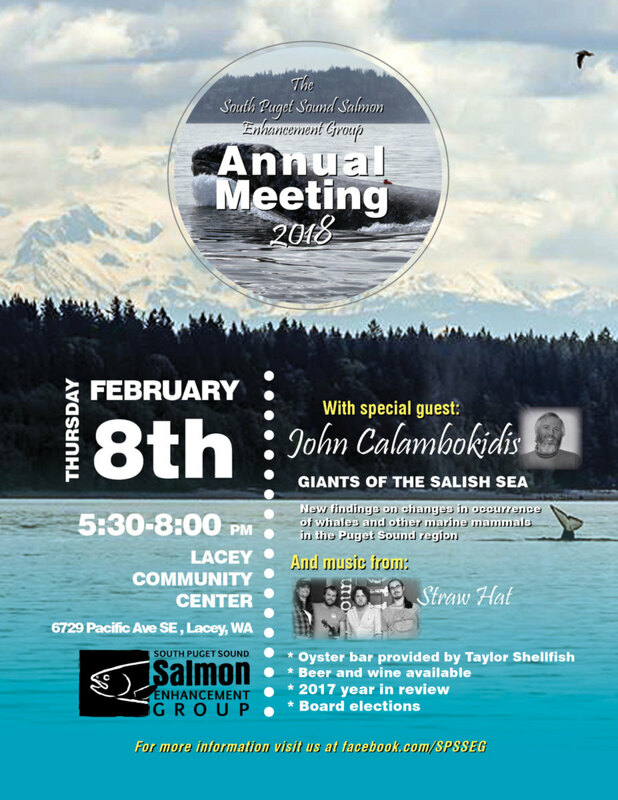 Renowned research biologist, John Calambokidis will be presenting his latest research findings on marine life in the Salish Sea starting at 7:00. This is a free event, but if you’re not a member already, we hope to welcome you into the SPSSEG family with a $30 annual membership!